Isometrics is nothing new in fact; the military in many countries have used isometrics as a fast and simple method to strengthen the core muscles in their fighting forces. Schools have used isometrics as a form of exercise in their physical education requirements. The name isometrics is formed from two Latin roots meaning “equal length”. You will understand the meaning better when we get into the actual exercise descriptions. There are many ways to perform isometrics. Once you have a more complete understanding of the exercise you can create your own custom exercise routine and even make the experience more fun for you. So let’s quickly run through the few terms you need to know about certain muscle groups in the body. Twitch Fibers. These are parts of every muscle in the body which is what makes the muscle contract when the brain sends the signal to do so. They come in three different types. Slow Twitch Fibers. These are the twitch fibers that do withstand the rigors of isometric movements without tiring as fast. Intermediate and Fast Twitch Fibers. These show up in the arms and legs and all other muscles not used for posture which can tire easier than slow twitch fiber muscles however, these muscles also lend more power to a movement in a shorter period of time. Ok, now that we have the basics of the mechanics in the body that isometrics deals with, we can now move on to the further benefit of isometrics. One of the largest benefits in using isometrics is the convenience factor. The growing appeal in a world which is becoming busier and busier is the fact that you can stay in shape with isometrics anytime during the day that your schedule allows and anywhere you may be. Isometrics can be so discreet and powerful that you can use it anywhere, even in a car on the way to the office! Isometrics has a great benefit to those wanting to look and feel younger as it has cosmetic benefits as well. There are isometric exercises that make your face appear visibly more toned and youthful and who doesn’t want that? Let’s cover first what a set means in case you are not familiar. A set means you have completed one repetition of the exercise a certain number of times. So when a set of 10 repetitions is asked for then this is what a set means. Ok now that we have that down, let’s get sweating. Sit on a chair with an upright posture with back and tailbone pressed to the back of chair with chin up and shoulders back. While looking straight towards the wall ahead, lift right leg from the knee and point straight outward. Beware that your knee is not consciously locked or too stiff. Flex your foot straight up to the ceiling nice and tight. Replace foot and leg to original position. This is one set-repeat ten times. Stand or sit but be sure back is straight. Join both hands in praying position then interlock fingers. Press your palms together firmly-you will feel your chest flex if you’ve done it right. Hold the muscles tight for a count of ten. Repeat four times for a total of four sets of ten second holds. Stand facing a bare wall- feet shoulder width apart- no more than five feet from the wall. Place both palms on wall shoulder length apart. Without moving your feet, bring chest in until your nose near enough touches the wall and push back. This is like doing a pushup except your wall is the floor. Bonus Challenge: Get this exercise to be more of a challenge for you. Move the exercise to a desk or a very stable table so that you have a tougher time pushing back. Flex forearm so hands are parallel to shoulders with fists clenched slightly. Turn out elbows as you are going to flap like a chicken but do not straighten them out. Push your arms up over center of head. Bonus Challenge: Use a book or dumbbell in hands next time to add resistance to your push. Sit or stand with hands on side or placed on hips. Feet should be shoulder length apart. Pull or “draw” in stomach in and up toward your diaphragm. Hold in for five to ten seconds then push out. Do this ten times max, five times minimum. Sit with your tailbone on edge of chair or stand with back straight. Have feet shoulder length apart. Lock fingers with your palms facing away sort of like you are ready to crack your knuckles (just don’t –it’s unhealthy). Extend your arms out and over your head keeping fingers locked like you are going to stretch and yawn. Now, bend to one side from the hip and hold it there. Now, bend to the opposite side and hold. The hold should be for at least five seconds. Cross your right arm at shoulder length across chest. 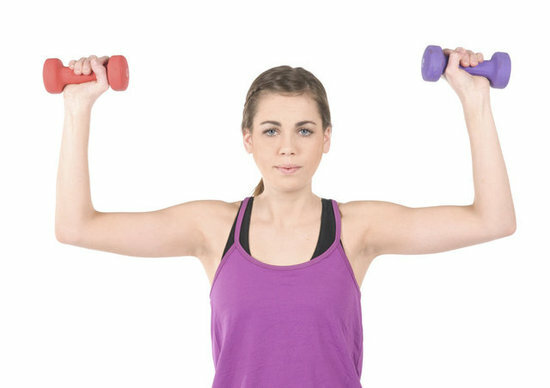 With left hand, grab your right upper arm and pull towards the right gently and try not to hyperextend and cause injury. Slowly turn head to the right as far as it will go comfortably and hold. Slowly turn head to left as far as it will go comfortably. Now slowly tilt head down so chin is as close to the chest as possible. If you can touch your chin to chest that is great only make sure you don’t hyper-extend it. Warning: Never tilt your head to the back because it puts a ten pound pressure on the upper spine. This can cause injury and therefore be counterproductive to the exercise. For the most part if you are in good health with no major issues such as high blood pressure or cardiac issues, you can do isometrics safely and reap the benefits. Isometrics is as safe as any other exercise with one minor concern. You should seek a physician’s approval prior to beginning any exercise regimen. However, when you have high blood pressure you should do so especially. This is because isometrics can cause a spike in blood pressure and affect the heart rate for a short period of time that may, in rare cases prove a bit dangerous to some.